Anyway, this is my third try at the Marion redingote. To make this one, I did the alterations to the previous version, the one I drafted myself. I re-drafted the sleeves, letting them take up a lot more space on the front and back bodice. I also lowered the bottom of the armscye quite a bit and widened the top of the sleeve (I'll post an explanation about that tomorrow). I went for a completely different pocket design. I narrowed the waist a bit and flared out the skirt. I also altered the lines at the back, making the center panel narrower (to be more like the Marion design). For a normal coat, I would consider the waist over-fitted but in this case, I think it suits the style. 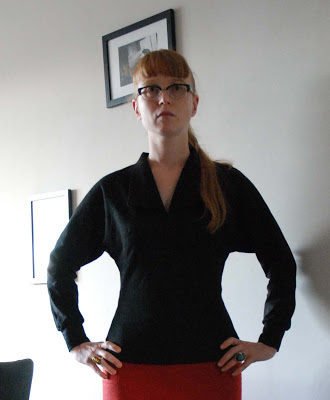 In all the pictures I have of post-1947 redingotes, the waist is quite tight. I may let the bust out a little bit though. Under my eyes, this was thrown onto the '50 cent a piece' table. I could see it was silk, so I took a hold of it straight away. The label confirmed my idea: thai silk 100%. Pink with polka dots. I think it ended up with the bargain stuff because of the state the sleeves are in. 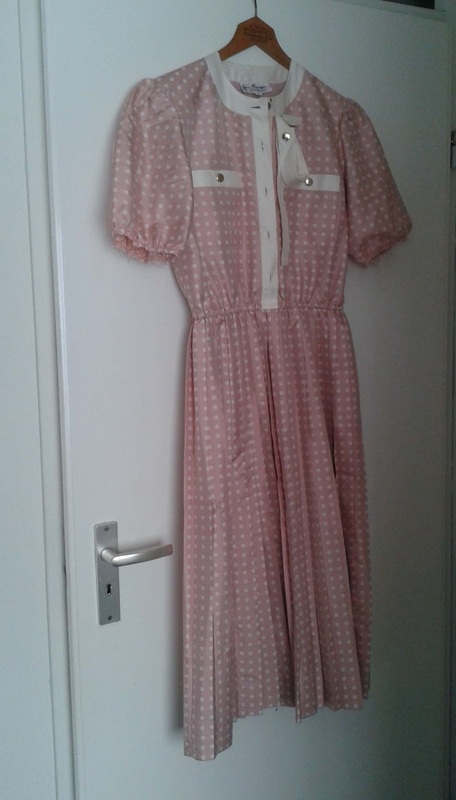 The dress doesn't have stains or signs of wear but it rather looks like someone abondoned it in the middle of a minor re-fashion. The white cuffs were taken off but are still with it and the sleeves were gathered at the bottom. Maybe they were originally longer? Without really expecting anything, I googled the name on the label. It's designed like an autograph, so I wasn't even sure I had deciphered it correctly. The name was Jim Thompson. I didn't take a picture of the label, but you can see it right here, on the website of the still-in-existance company. And wikipedia provided even more information: mr. Thompson was very much a real person. Originally an architect who had a colourful carreer during the Second World War which eventually took him to Thailand. He stayed there after leaving the army in 1946 and devoted himself to revitalizing a cottage industry of hand-woven silk. His efforts had a major impact, establishing the fame of thai silk and helping some of the countries poorest people. After his mysterious disappearance in 1967, the company went on under his name although did start producing in a factory. I never expected to find out this much about the brand... It's quite fascinating. 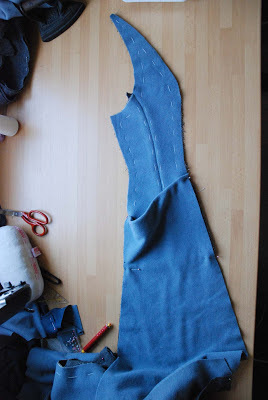 I had the day of today, so there was time to work on the coat pattern. I never like getting zero comments to a blog post but I guess that teaches me for doing hasty posts with bad pictures... (also, to get rid of a certain kind of spam, I recently disabled anonymous comments on the blog, I thought that would hardly effect real comments but I have had an email about it. I just changed the settings back, I hope the spammers have already left). Unfortunately, in this post, I once more only have some very hasty pictures on offer. I drafted this pattern based on the Marion design. I didn't add a collar yet, I plan on using the original Marion collar. Please ignore the fact that I accidentally cut the center front pieces 10 cm shorter than the other ones (I didn't draw the full skirt length on paper...) and the wonky pinning. First of all: this coat actually fits me. And you can see a body shape in it as well! I'm even fairly satisfied with the way the sleeves fit at the top of the shoulder. 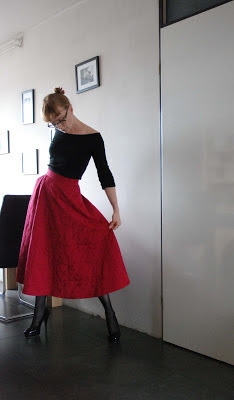 And the skirt now falls pretty much like a lot of redingote skirts in vintage pictures. 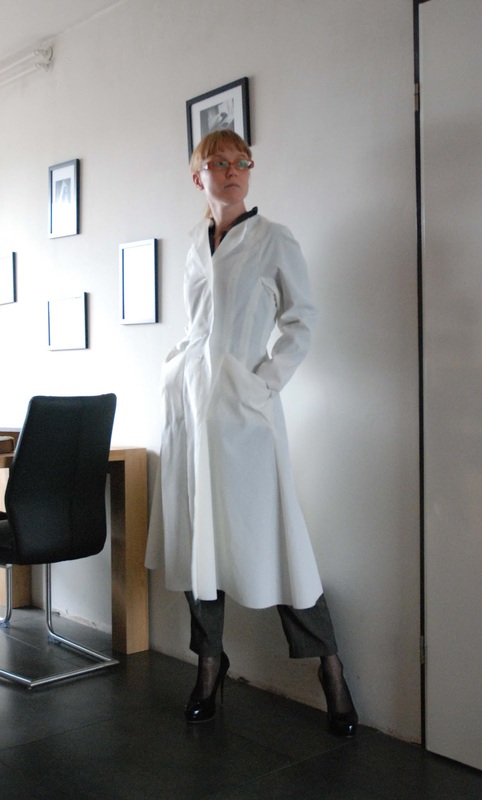 With just a couple of tweaks, this could be a rather nice coat. But then, there's a lot I don't really like. Those sleeves are too tight at armscye. There is a way to draft them, set lower, with ease at the upper arm allowing for a good range of movement. 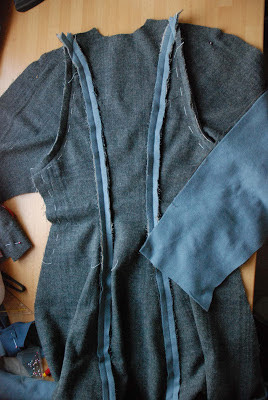 I also don't like how little space the raglan bits occupy on the bodice. Being more used to full raglan sleeves than to this pointy half variaty, I must have been far too modest drawing them in... I'm thinking about re-drafting the sleeves to adress these issues. I also think I would like the skirt to be a bit fuller yet. 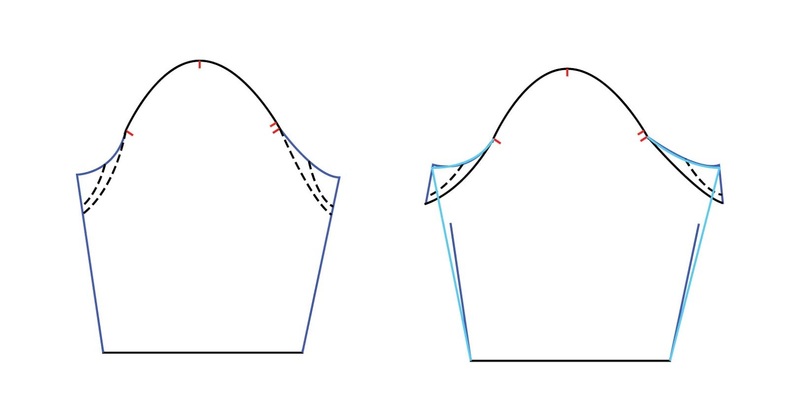 For this version, I simply followed the angle of the lines just below the waist which gives this form-fitting flare. 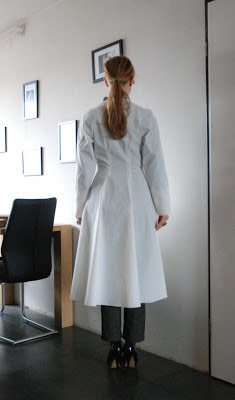 There's nothing wrong with it but I'd like a more spectacularly skirted coat. And of course, the skirt also needs to be longer. Along the same "it's actually not bad but I'd like it to be different"-line, I will tweak the bodice a bit. It's a tiny bit snug at the bust, which is easily remedied. 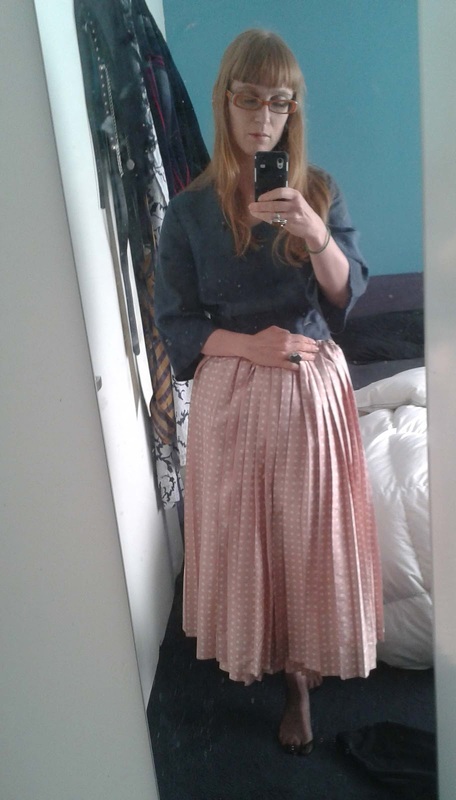 It has a normal fit at the waist by today's standards but I think I will tighten it up just a little bit there to get a bit more of that 1950's look. And then there are the pockets. 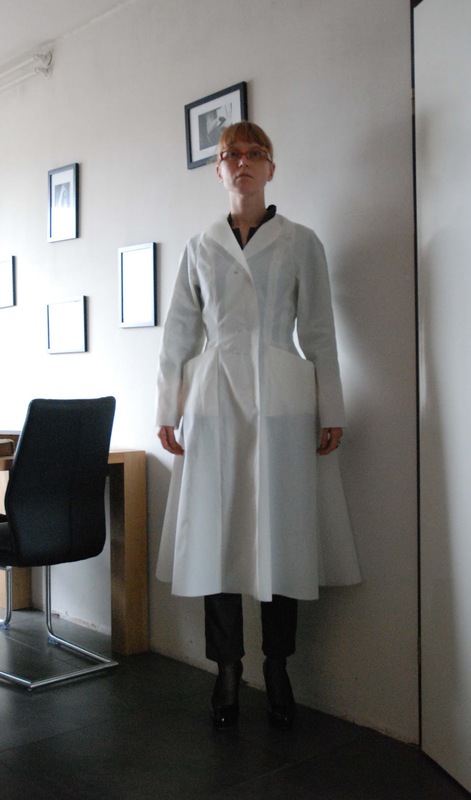 I copied the design from the Marion coat but I'm still a lot less then thrilled with them. 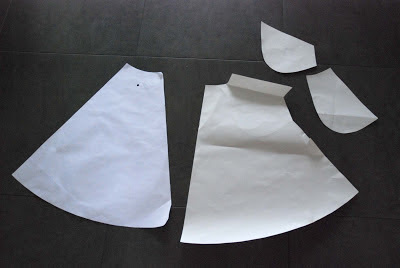 I'm going to abandon the the curved scoop pockets in favour of somewhat draped stick-out pockets like those on my skirt. Those new pockets will also be placed a bit lower. Even my rather quick and un-thorough research was enough to reveal that not redingote but the swagger was the dominant coat style of the 1950's. For most of the time, both styles existed along side each other but it looks like swaggers were worn and certainly sewn a lot more. And if you include the swagger's shorter sibling, often called 'topper' it really reigns supreme. However, I have tried to focus on the redingote. In 1948, just one year after the introduction of the New Look, the redingote was very much 'en vogue' as this spread from Libelle shows. In the editorial comment, it is told that the skirts of the redingotes, like those of the dresses, are this year to be less full than the last (the real New Look redingotes) although coats should still be long. There are swaggers too, but the redingote clearly steals the show. I think this is the shape we usually have in mind when thinking of a "New Look" or "50's" coat. As you can see, a 1948 redingote could be either single or double breasted, might still sport shoulder pads (the double breasted one on the right page. In those days, that was considered a small shoulder pad and many were glad to get in back after the sloping shoulders of the New Look), had kimono- or set-in sleeves, a very tight waist and could have any kind of collar. How great and crazy is that one on the far right? 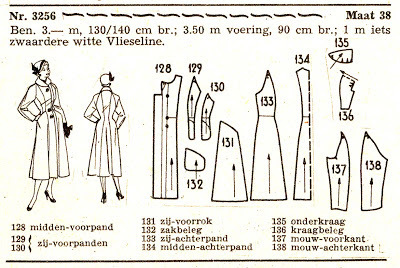 ... nor among the sewing patterns. 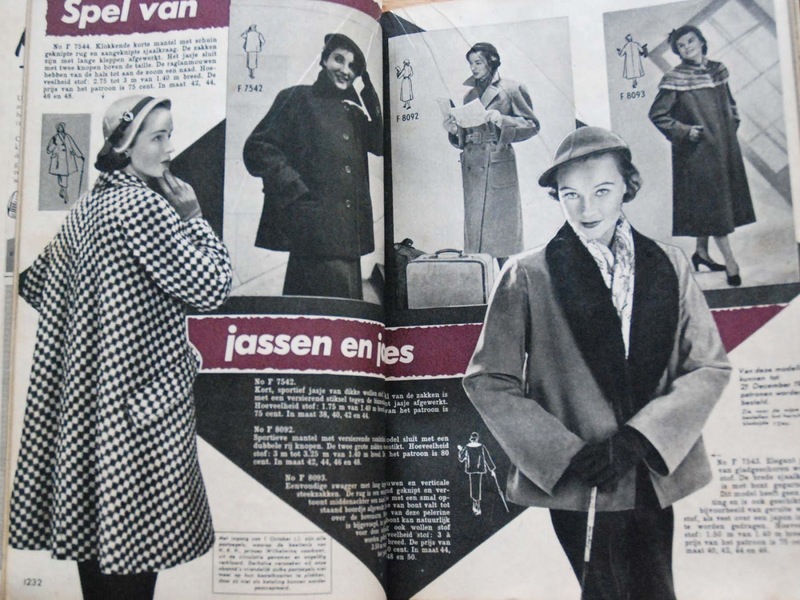 And no, that trenchcoat-like one is not a redingote. It's described simple as a 'sporty coat' and from it's look I'd say it's completely straight and slightly pulled in with the belt. In fact, I've never seen the term 'redingote' used for a coat with a real belt. 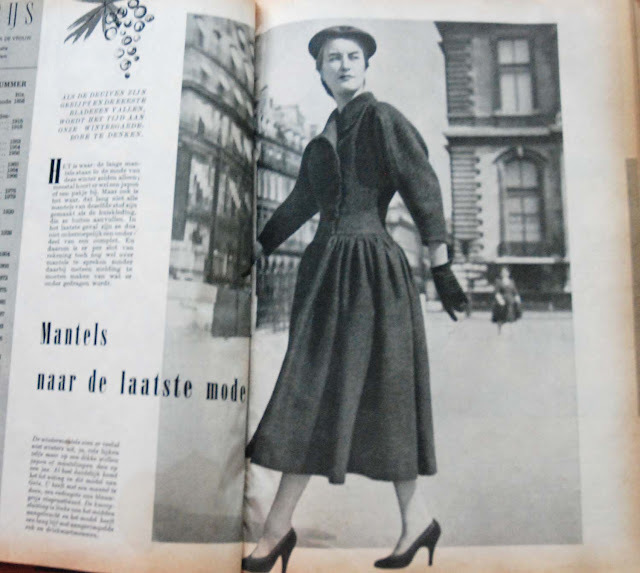 For the winter of 1955 the same magazine, Beatrijs shows a very different picture. It's no longer all about wide coats but the old redingote hasn't quite returned either. This seems to be the era of the fantasy versions of the redingote. For the one above, the term redingote could maybe be used. It is gently fitted at the waist, has raglan sleeves and the skirt gets its width from loose pleast attached at the bodice some 5 cm below the waist. 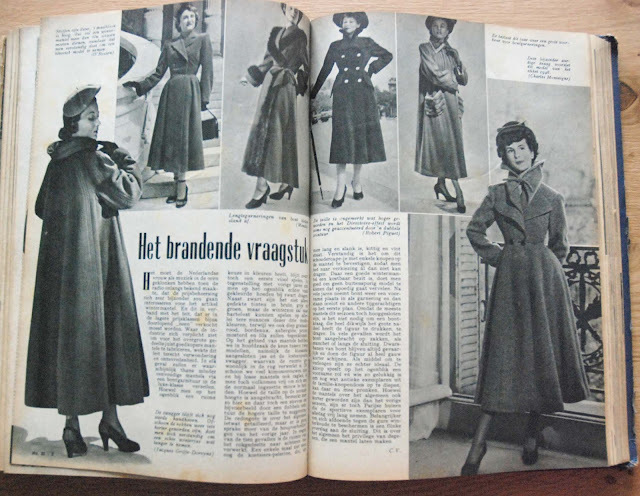 On the next page, the second coat from the left has a more obviously classic shape but a decided kind of decoration with those huge pockets on the skirt. This page also introduces two new silhouettes: a business-like straight one of the far right and a loose-yet-shaped option on the far left. In 1956, according to the magazine "Goed nieuws voor de vrouw" both swagger and redingote continue to be fashionable. If we concentrate on the redingote (look away from those marvelous suits on the right page! ), several things attract the attention: The skirts are rather sleek, they have a lot less volume than that pocketed one from the year before. 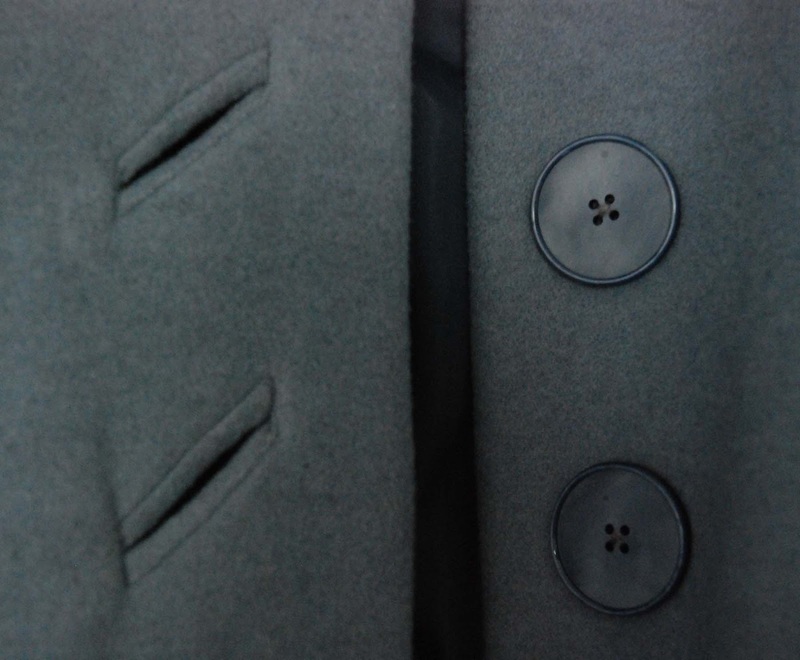 The collar is now the prominent feature. And then there's the closure, a probably rather impractical, long, single line of small buttons. This is, in fact, very much in line with the fashion for dresses at the time. Finally, we get to the end of the decade, 1959, brought to you by Madeleine magazine. The heyday of the narrow waist is coming to an end. 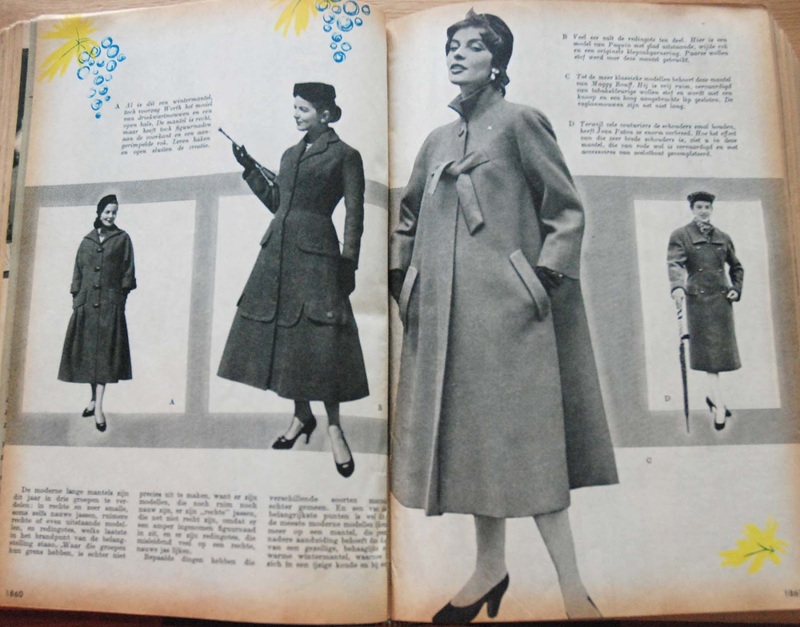 The fashion plates show wide coats, not so much the flared-from-the-shoulder swaggers of yesteryear but new shapes with clean lines. That's it from Paris, but from Italy, Madeleine can still report on a fantasy redingote. 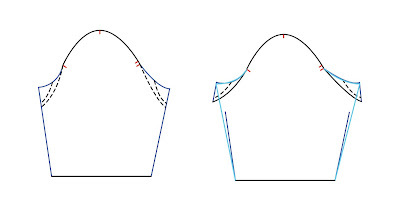 Once more, an option with a skirt gathered or loosely pleated from a below-waistlength bodice. That's it for now. 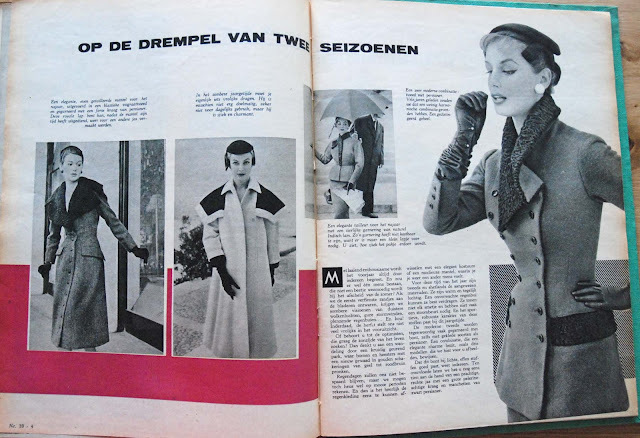 I think the use of the word 'redingote' may have ended with the 1950's or somewhere in the first half of the 1960's, at least in its use in the Dutch language. The coat it had come to describe didn't really disappear. It went in and out of favour, changed according to the requirements of fashion but in fact, it's still with us. So, by the end of last week, I found some time to trace the pattern for the Marion coat. Although the pattern sheets look choatic, they are actually not that bad. Black on yellowed white is much easier to see through tracing paper than red or green on grey-ish recycled paper... And obviously, I wouldn't even think about taking a tracing wheel to a nearly 60 year old pattern. 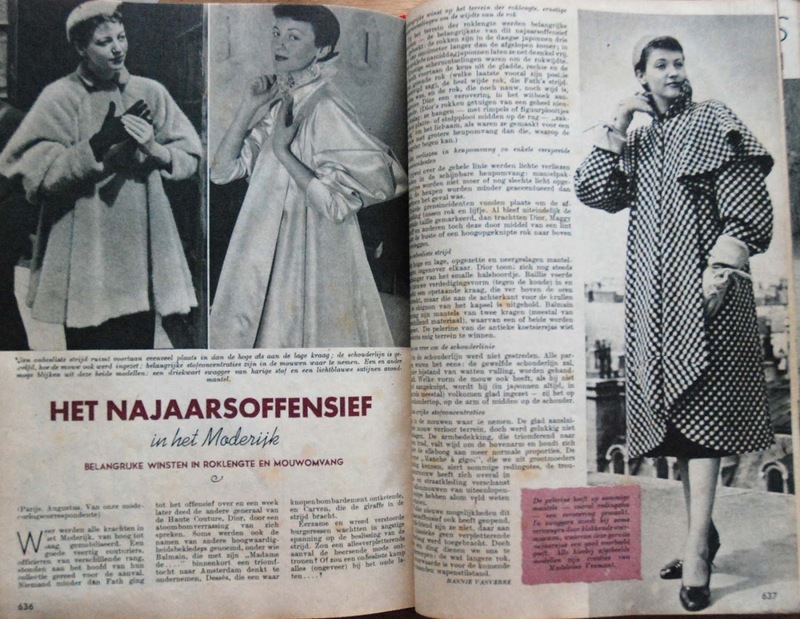 As I told you, the pattern was in size 38, which, in 1950's Marion, was the smallest ladies' size. It's bust 88 cm, waist 68 cm, hips 96 cm. The size of the dress I made this summer was 36, which they sometimes mention as a small ladies' size but is actually considered to be the size for 14-16 year old girls. That size has bust 86 cm, waist 68 cm and they don't mention a hip size because young girl's don't wear narrow skirts. I'm at about bust 84, waist 65, hips 94 myself and I remembered a suprising amount of ease at the waist and a high waistline from the dress experiment. I decided to go ahead anyway. 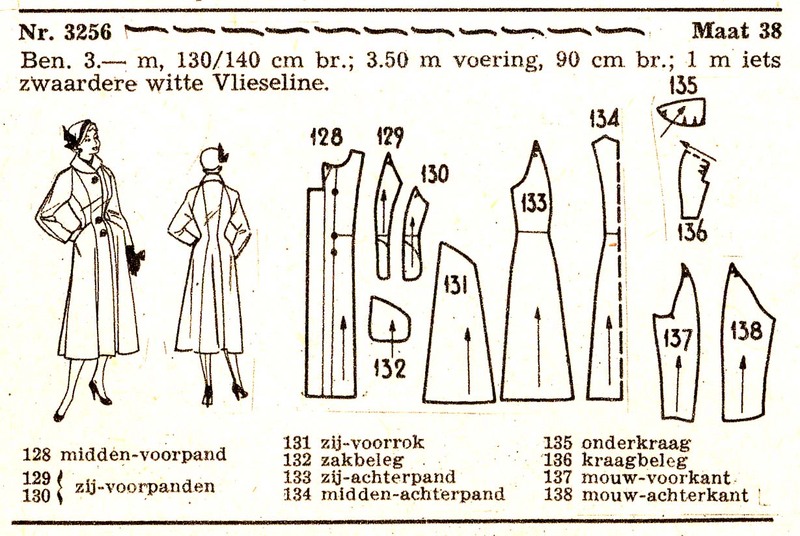 One of the great things about these patterns is to find out the actual proportions of fashion which I mostly know through somewhat idealized fashion plates. Despite those misgivings, I cut the coat in my muslin fabric. As the measurements stated about indicate, I could expect it to run a bit big but the alteration I made at this stage was to lower the waistline by 1 cm (in line with my experience with the dress and with a measurement of the center back). On Sunday, I completed my muslin. Unfortunately, it was a very dreary day so by the time I was finished, there wasn't enough daylight left for pictures. I only found time for that this morning, between a dentist appointment and going to work, on a another rainy day (which is why I don't look nice at all in these pictures). As it turns out, there's no such luck. This coat is ridiculously too big. Even when worn over a sweater, I can easily pinch in 10 cm at the waist (and sizes go up by 4 cm intervals!). 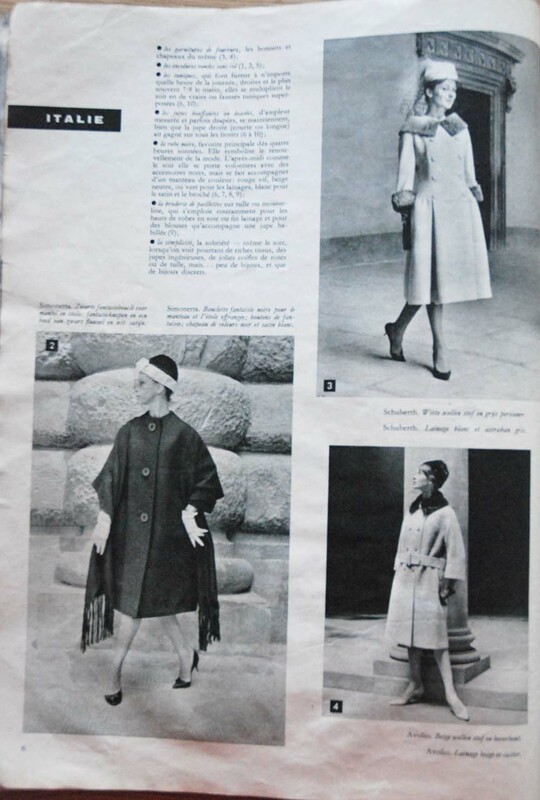 Of course I know coats need ease, but this is one is supposed to be closely tailored at the bodice! Weirdly, the chest seems less oversized than the waist and hips but that may be down to the fact that the whole thing is pulling back rather substantially. Oh, and it's just so flat. Tailored, fitted coat? Redingote? Nice feature pockets sticking out a bit from the hip? None of that. It's not really wide enough for a swagger but there's neither fit nor flare. On the up side, I like that collar. It's a little shawl collar made higher and more lofty by four little darts, two on either side of the center back. 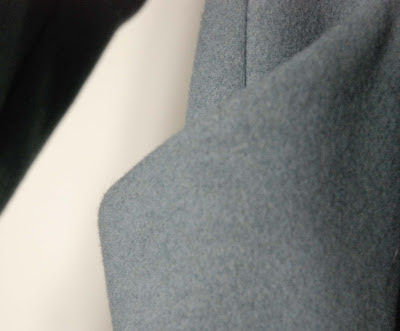 It both flattering and practica because it allows for a bit of a statement collar which is still quite closed-up and therefore warm. Oh, and my waist-length alteration seems to have done the trick. All in all, I don't think I will be grading and altering this pattern. There's just too much which I don't like or is way off. I think I will try and draft my own pattern based on the drawing of this one. 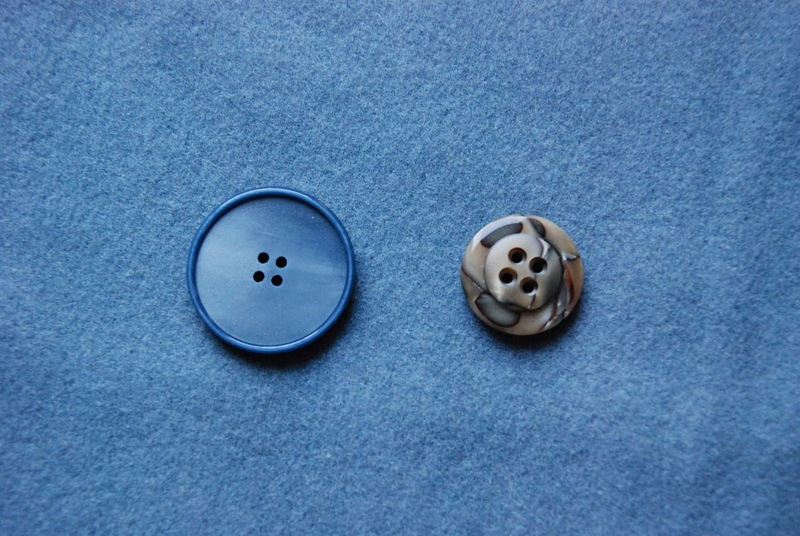 Although I will try and incorporate the original collar. My interpretation of the design if you will. Stay tuned for the next muslin!